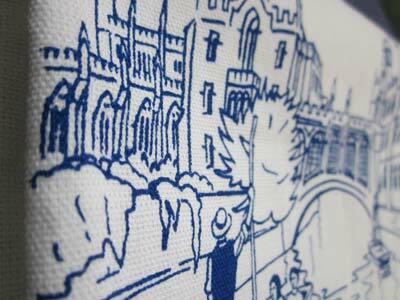 There are two designs of tea towel both in a choice of black or dark blue on white. 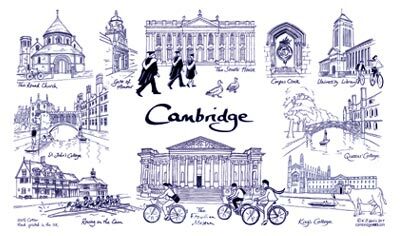 They are 100% cotton, hand-printed in Norfolk and measure around 48cm x 76cm (19 x 30 inches). 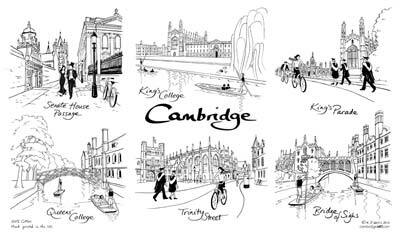 Both feature recent line drawings of popular Cambridge sights by K J Lewis including views of King's College, the Bridge of Sighs, the Mathematical Bridge at Queens' College, Fitzwilliam Museum and the Senate House. Please email for more information if you would like to buy in bulk or wholesale.